Paynes Ford is probably New Zealand’s most popular sport climbing crag. Lets look after the place. Please! Paynes Ford is a Scenic Reserve at which DoC tolerates our climbing. It is a privilege not a right to climb here. That privilege could be withdrawn. This brings with it a responsibility to use and conserve the resource for others. It is not the general public that wanders around the bottom of these cliffs it is climbers. If you are a recent visitor what “was” here might not be apparent. Over the years there has been a lot of intentional and unintentional damage to native vegetation in particular, along with compaction of the soils around the base of the climbs and erosion on unofficial shortcut tracks. Drip-line mosses have almost all vanished. The bush is much more open now as our presence has forced back much of the native plants to meet our needs. As numbers of climbers grows the pressure increases rapidly. Thanks to all those climbers who are caring of our environment. DON”T even think about putting up a new climb if it means removing/cleaning moss or vegetation as has been done recently. 1. Keep to the established and often marked tracks. The good folks who care about the place are busy building small stone barriers around regenerating Kahikatea, Miro and Matai, please watch out for these. We don’t know where all these little beggars are so please keep your eyes open. 3. Don’t walk to the tops of cliffs. In 1999 there was a very dry, hot summer and all the Hebes and Kowhai that lined the cliff tops died off. Little, wee ones are just starting to come away again and won’t benefit from little human feet trampling on top of them. Put top ropes up by leading routes or get some strong type to do it for you. 4. Clean tick marks and excess chalk off the cliff and holds. This stuff is visual litter and makes holds really greasy on hot days. Long may there be hot days. 6. Please abseil from the top of cliffs rather than lower from the fixed anchors. This helps the hardware at the top last a lot longer. Running a top rope through the fixed anchors is about the worst thing you can do. Use a biner at the top instead. 7. The bolt fund and the folks who stick the stuff in the cliff can’t and don’t want to fix all your fixed anchor woes. Assessing whether bolts will stay put is your responsibility. You can help by carrying a spanner to do up loose bolts. Please don’t come sniveling to us if it all goes wrong. 8. 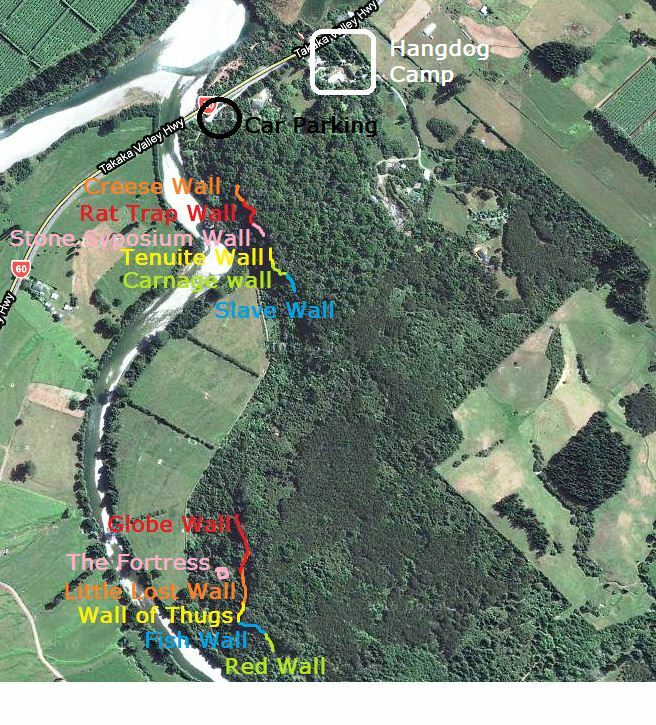 Use the loo’s provided (DoC loos at Paynes, loo’s at the port of Tarakohe, public toilets behind the tennis club at Pohara, and the loo’s at Hangdog). No shitting in the woods, loo paper daisies or burning loo paper please. 9. Learn what banana passionfruit is and kill it by cutting the vine at its base. 10. Kill all possums and rats. If you’re new to this country, Possums aren’t cute, cuddly tree bears, they’re a noxious pest that consumes huge amounts of vegetation, young birds and eggs. The most effective way of killing them is by biting their nose off with your teeth! If you’re too spineless to do this then try pointing a small blond dog at the possum, she’ll do the biting for you. 11. There are some areas that local climbers have either agreed not to climb on or not develop to keep in harmony with the local non climbers. Check at Hangdog if you’ve spied some rock you want to be let loose at. 12. Give a little dosh to the bolt fund. It’s managed by an odd and only semi-organized but passionate bunch of volunteers who generally know what they’re doing. We only have the route names & other statistics. Please feel free to add some desriptions and topos the framework that is in place.